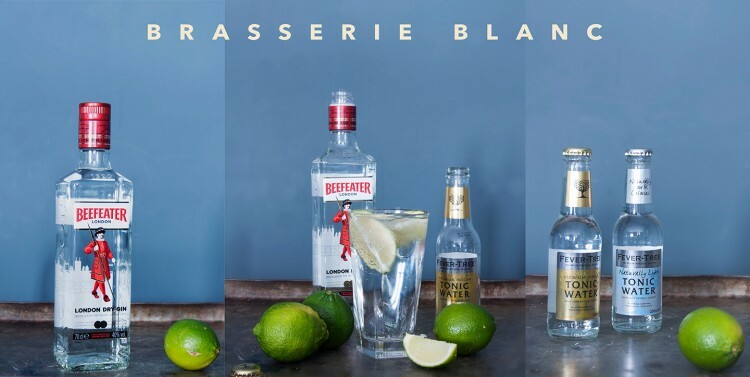 To celebrate the re-opening of our newly refurbished brasserie in Southbank, and our stunning new cocktail bar, we have teamed up with Beefeater gin and Fever-tree tonic to give away FREE G&T’s all March. Every Wednesday and Thursday evening from 6pm in our gorgeous new bar, we have 75 FREE gin & tonics to give away. Just watch out for our tweets from @brasserieblanc and @BBlanc_SthBank, RT and then show us to claim your free drink. The offer is first come first served so get here early as only the first 75 people to show us their retweets every Wednesday & Thursday this March can claim their free drink. Make sure you follow us so you don’t miss the tweets. Offer only available in the new Southbank Brasserie Blanc bar every Wednesday and Thursday evening in March (9th, 10th, 16th, 17th, 23rd, 24th, 30th, 31st March). The free drink is a Beefeater gin with Fever-tree tonic. Offer valid for 75 free G&T’s per evening. Guests must show that they have retweeted the offer to claim their free drink. The offer will be on a first come first served basis from 5pm on the dates shown, and is only valid while stocks last. The offer cannot be exchanged for any other offer. Only one free G&T per person can be claimed on any one date.